Adapting Pete Collins’ articles about the abduction and torture of businessman Marc Schiller in the mid-1990s must have been a problematic task. The story of the crime was driven by the protagonists, a group of unscrupulous chancers with few redeeming features, whom it would be impossible for an audience to like; Schiller himself was practically a peripheral character which made it impossible to tell large chunks of the story from his perspective, while private detective Ed Du Bois enters the story so late in the proceedings that the story would require a tortuous series of flashbacks and —forwards for his account to make sense. The solution of screenwriting partnership Christopher Markus and Stephen McFeely was to add a humorous element to the story which was, of course, almost completely absent from reality. 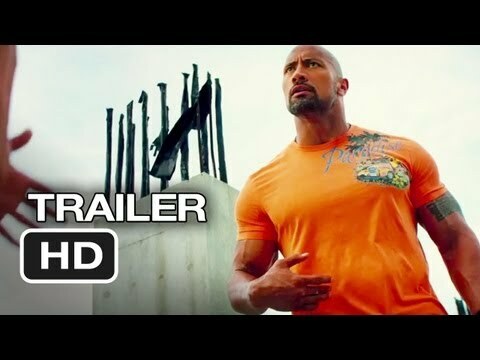 It was probably the best option available to them, but the darker side of the story of Pain & Gain makes this cocktail of laughs and violence a distinctly uneasy one. The story takes place in Florida during the mid-1990s. Ex-con Daniel Lugo (Mark Wahlberg — 2 Guns, Broken City) works as General Manager of the Sun Gym, a position he acquired on the strength of his promise to its owner, John Mese (Rob Corddry — Warm Bodies) to triple its membership within three months. Lugo achieves this, but he’s gripped by an envy of the wealthy patrons — in particular a smug and rather condescending self-made millionaire named Victor Kershaw (Tony Shalhoub) — and a burning desire to have what they have. Hard work brings only limited rewards, however, and anyway, deep down, as Lugo confesses to his best friend Adrian Doorbal (Anthony Mackie — Gangster Squad, Abraham Lincoln: Vampire Hunter), he feels he deserves the kind of privileged lifestyle these people enjoy. Lugo has the aptitude to work hard but lacks the ability and organisational skills to convert his labours into the kind of financial reward he desires, and sees get rich quick schemes — in particular the three-finger philosophy expounded by Johnny Wu (Ken Jeong — The Muppets) — as the route to a fortune. The problem is, the endeavour to which Lugo chooses to apply Wu’s techniques is highly illegal. With the help of Adrian and Paul Doyle (Dwayne Johnson), an ex-con former coke addict, he determines to abduct Kershaw and torture him into signing over ownership of all his wealth. While watching, it’s easy to dismiss Pain & Gain’s story as too far-fetched to be true, but the fact is the plot sticks fairly close to the true events. Lugo and his accomplices did succeed in torturing Marc Schiller into signing over his money and belongings after torturing him for weeks — and they did bungle the abduction on a number of occasions before finally getting it right. Markus and McFeely do dispense with some major participants in the real plot (Schiller’s brother-in-law was heavily involved), but essentially what they show on screen is, with a few embellishments (such as Doyle barbecuing severed hands), how it happened in real life. The movie doesn’t shy away from showing that Lugo, Doorbal and, to a lesser extent, Doyle are capable of some despicable acts, but it softens the impact of their cruelty and lack of guilt or remorse by filtering their antics through this semi-comical tone and emphasising their individual motivations. They also paint Kershaw as a far less likeable character than Schiller (which is presumably the reason for the name change — although immediately after Lugo’s trial Schiller was arrested for masterminding a multi-million dollar Medicare fraud) in order to prevent any sympathy for him colouring our opinion of Lugo and his friends, so while we’re never really rooting for these villains we at least hold our breath with them when, for example, a drop of blood from the chainsaw they’ve been using to cut up a victim splashes onto the tabard of a sales assistant to whom they’ve returned the tool when it stops working. This ineptitude, which the movie always succeeds in making believable, also diminishes the increasingly horrific nature of their deeds. But Pain & Gain ultimately fails in its purpose simply because it’s never as compellingly watchable as the subject matter suggests it should be. With each twist and turn of the plot we’re left wondering just why the movie isn’t as enjoyable as it should be. Perhaps it’s because we’re watching a bunch of criminals trying to pull off a heinous crime, and part of us knows we should be sympathising more with Kershaw than we do. Either way, this inability of the movie to engage us in the way it should results in the already lengthy running time of 129 minutes seeming a lot longer than it actually is, even though the pace of the film means we’re never bored. Wahlberg’s spirited performance also holds things together well, while Dwayne ‘The Rock’ Johnson gives an unexpectedly impressive performance as the essentially sweet-natured Doyle, who struggles to reconcile the evil crimes in which he’s involved with his religious faith. Pain & Gain also benefits from a large supporting cast of colourful characters, but overall the feeling is of an opportunity squandered.